Simple sequence repeat (SSR) markers are a valuable tool for many purposes, such as mapping, fingerprinting, and breeding. However, they are only available in some economically important crops because of the high cost and labor intensity involved in their development. Comparative mapping reveals a high degree of colinearity between closely related species, which allows the exchange of markers between them. 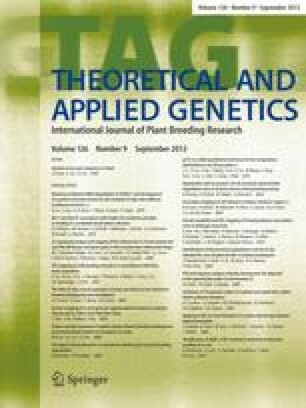 Our objective was to examine the transferability of SSR markers among wheat (Triticum aestivum L.), rye (Secale cereale L.), and triticale (X Triticosecale Wittmack). One hundred forty-eight wheat and 28 rye SSR markers were used to amplify genomic DNA extracted from five lines each of wheat, rye, and triticale. Transferability of wheat SSR markers to rye was 17%, whereas 25% of rye markers were amplifiable in wheat. In triticale, 58% and 39% transferability was achieved for wheat and rye markers, respectively. Wheat markers gave an average of 2.6, 2.7, and 2.4 polymorphic bands in wheat, rye, and triticale, respectively, while rye markers gave an average of 2.0 in rye and none in wheat and triticale. These transferable markers can now be exploited for further genetic and breeding studies in these species. The authors would like to thank Drs. Perry Cregan and Qijian Song (Soybean Genomics and Improvement Laboratory, USDA-ARS, Beltsville, Md.) for kindly providing the sequence information for the BARC markers, and the Ministry of University Affairs, Thailand, for partial support of this research.